The Everyday corset is an award winning modern corset for women of today. Designed by Victoria Whiteland, an expert corsetière with over 20 years experience in figure-enhancing couture corsetry and underwear. A traditional corset is not particularly suitable or appropriate for wearing under a modern woman's every day wardrobe, or office clothes! It is this problem that I set out to answer. Over a period of years I developed and perfected The Everyday Corset. A corset that women can wear whenever they wish. A garment that will change women's lives - and the way women everywhere see themselves. Our grandmothers knew that wearing corsetry could mould and reshape the figure naturally. My corsets are modern and ergonomic, created to give support to the muscles of the stomach and lumbar region and will re-define the figure naturally. A corset can improve the effects of ageing and discomfort by supporting the flesh without allowing it to sag, and will provide gentle long term shape maintenance. The Everyday Corset is helping women to maintain a healthy and attractive physique. It is functional yet beautiful. I am a professional corsetière and couture designer with a wealth of experience and high profile work for a variety of individuals and fashion houses. I have spent many years designing and producing corsets with the customer's individual needs and concerns in mind. "It's my hope that The Everyday Corset will be welcomed by women as confidence inspiring, figure enhancing, something that they will be glad to own." I received my Everyday Corset today, and I am absolutely in love with it. It's comfortable, and I feel so confident in it. And not to mention, this is one of the best priced corsets out there. You do some absolutely beautiful work. Keep it up! H.C. 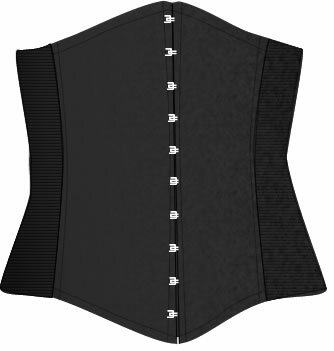 The Everyday Corset is an evolving concept, and we would love to keep you informed with new developments. By subscribing to our mailing list you can ensure you won't be left out of any special offers or important information. Your details will not be passed on to anyone else or used for any other purpose. We use the services of MailChimp.com to keep your details safe. You can unsubscribe at any time. You will be sent an email when you subscribe than you must confirm. Other sizes are available upon special request. We make every effort to ensure that the corset you receive will be a comfortable and a perfect fit. To help create the most wonderful shape for you and give you the optimum waist and tummy reduction, please check the size chart below before ordering. 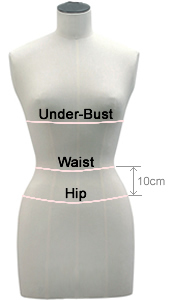 If you find that you don't fit any of the standard sizes below, don't worry, we can offer you a made to measure Everyday Corset. Simply give us your under-bust, waist and high hip measurements. New: Introducing the new Everyday Corset 12" Summer Whites. Please get in contact if you would like to order. Once you've made your choice, please click the 'Buy Now' button to place your order. PLEASE NOTE: for convenience we use the PAYPAL checkout system. This does NOT mean that you need a PayPal account to buy. If you prefer to pay by cheque or postal order then please get in contact. Copyright © 2005 - 2019 Victoria Whiteland. All rights reserved.